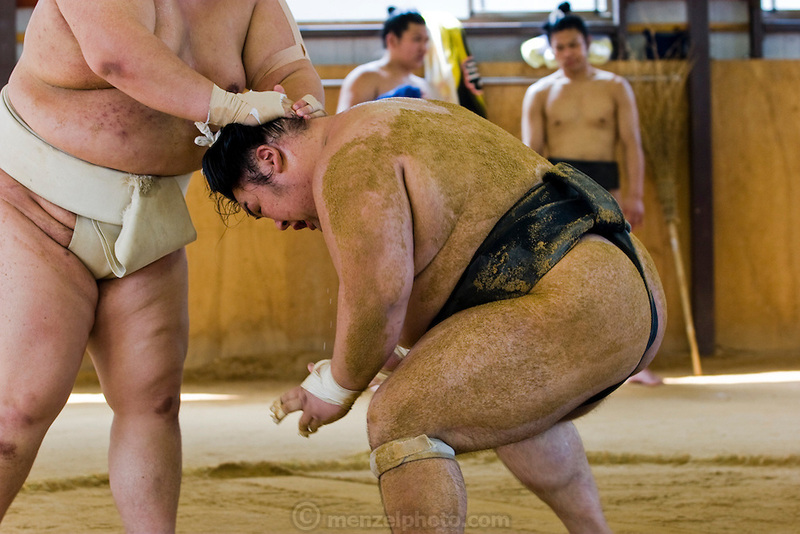 Masato Takeuchi (at left, his ring name is Miyabiyama), a sumo wrestler at the junior champion level (sekiwale) touches an opponent who he has thrown to the ground during practice for a tournament in Nagoya, Japan. (Masato Tekeuchi is featured in the book What I Eat: Around the World in 80 Diets.) Miyabiyama is one of the largest of the Japanese sumos and would probably have moved up even further in the ranks had he not suffered a severe shoulder injury. He is only just now returning to matches. MODEL RELEASED.